Just how much functionality do you want in a single device? If your answer is 'everything', then look no further than the HTC TyTN. This Taiwanese company has been making smartphones for the phone networks for a few years now, and this is its most impressive one yet. The TyTN combines traditional 2G and 3G phone calls with wireless internet access, digital photography and even a keyboard so you can type those memos and emails on the go. The TyTN is a handful in more senses than one. Its plastic 176g case just about fits into a jacket pocket and is large enough to look retro when you're making a call - that's if you can use its awkward virtual number-pad without accidentally hanging up by brushing the touchscreen with your face. At 2.8-inches the screen looks enormous on a phone, even if its 77,000 pixels lack the sharpness of most camera LCD screens. 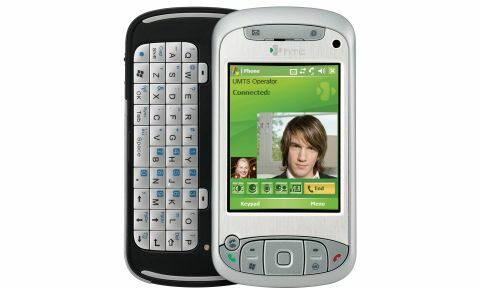 The Windows Mobile 5.0 interface is simple to navigate, either with the supplied telescopic stylus or using the four-way buttons and handy side-mounted jog dial. This makes the TyTN just about usable with one hand. There's plenty of software on board and most of it business focused. There's a full suite of Mobile Office applications, PDF reader, Pocket MSN, Exchange server, push mail and an acceptable Internet Explorer. Use this with the simple Wi-Fi and you can be browsing at home or via café hotspots in moments. Better still, if you object to high mobile call charges, the TyTN comes with Skype software for free (or at least very cheap) VoIP calls. Sliding open the phone reveals the full QWERTY keyboard. Cramped and plasticky it may be, but it's undeniably faster for typing emails and texts than using a number pad, even if you wouldn't want to type the annual report on it. There's Bluetooth and infrared communication, too, and it's also ready for the next generation HSDPA technology. The main two-megapixel camera is selected via menus or a dedicated camera key. The TyTN frames in landscape mode, with size and quality options. You can shoot a burst of frames (though only at VGA resolution) and adjust metering zones, exposure compensation and white balance. Next to the lens there's a self-portrait mirror, a tiny mechanical landscape/macro switch (no autofocus here!) and an LED light. This is very weak, so you need to be rather up close and personal with your subject to get enough illumination. Image quality isn't bad at all. Colours and detail are strong, noise is well controlled and exposure is generally good. Stick to bright sunlight and you might even think you're looking at genuine camera snaps, albeit ones with over-sharpened edges.